The Helvetia is the official magazine of the New Zealand Swiss Society. It is published every two months, and is offered in either printed or electronic form. Its key aim is to support the Swiss Society and its members, and to provide information on a range of subject matters of interest. 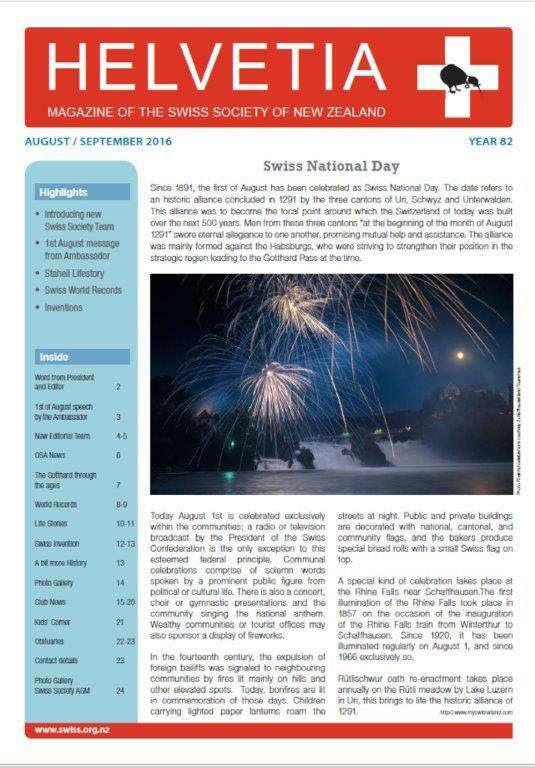 This includes information on past and future activities organised by the Swiss regional clubs around New Zealand, Embassy news, Swiss news, as well as a wide range of other topics of interest. The Helvetia provides a forum to discuss key concerns of Swiss people in New Zealand where necessary. It welcomes contributions from all Swiss Society members. Above all, the Helvetia aims to cater to all generations and interests in a meaningful and lively format, and to foster the spirit of friendship. The Helvetia is funded partially through Swiss Society fees and partially through paid advertising. It is currently produced by a team of volunteers from the Auckland Swiss Club. Please contact the Editor Heidi Wehrle at editor@swiss.org.nz.